Powered by the humongous rise in air pollution levels across the industrial landscape, the global filter bags market share has observed a commendable increase lately. The product has been suitably designed to perform maximum filtration in various industrial applications, enabling the development of various products without having to worry about the generation of large quantities of pollutants which can cause severe health and environmental issues. Filter bags are known to collect dust particles with sizes ranging from 1 micron to 0.01 micron in diameter at efficiencies over 99% or 99.9% while withstanding high temperature conditions. The product is thus highly suitable to be used across the metal, cement and power generation industries, which would help impel the scope of the global filter bags industry. One of the most important applications that demands the deployment of filter bags is water treatment, owing to the exponentially increasing need for clean water supply across the globe. According to the Natural Resources Defense Council (NRDC), scarcity of clean drinking water is one of the main reasons for illnesses around the world, contributing to around 2 million deaths per year. To counter this issue, water filtration plants are increasingly adopting filter bags to precisely remove extremely fine harmful particles and to reduce the cost of wastewater treatment. The product also helps industries to save on anti-resistant chemicals further helping to protect and extend the life of the membrane systems. Moreover, filter bags can also be used for industrial well water filtration, pipe scale removal, silt removal, and for removing sand & algae from sea water. Another vital industry that is likely to help augment the growth prospects of filter mags market is the pharmaceutical sector. The manufacturing of pharmaceutical products such as vitamins, minerals or herbal drugs involving a broad range of processes leads to the generation of harmful particles and gases. Indeed, filtration & separation are key processes which involve the usage of filter bags to ensure that products are adequately purified and fit for consumption. The product is seemingly used in the pharmaceutical sector to filter used syrup, galenical extraction liquid, protein removal from plasma and filtration of gelatins, active carbon, hormones and vitamin extracts, helping companies to develop products with increased purification levels, improved quality whilst saving on machine and labor costs. Reports from Global Market Insights cite that the filter bags market size from pharmaceutical application is likely to exceed over $215 million by 2024. For most parts, pulse jet filter bags seem to have gained mass appreciation in recent times. The product is utilized in the paper & pulp industry to separate fine particles and is also used in recovery processes and mills. Due to its advanced design, the product can be cleaned easily by using a short burst of compressed air passed through a shared manifold over a row of bag filters. Moreover, as it is not compartmentalized, the product can operate at higher air-to-cloth ratios making it smaller and cheaper than other filter bag products available in the market. The growing demand for paper to replace plastic bags from the packaging industry will also help augment pulse jet filter bags industry size, slated to register a CAGR of 5.5% over 2018-2024. From a regional perspective, it would not be incorrect to claim China to be a pivotal revenue pocket for the global filter bags industry. As a matter of fact, the China filter bags market size is expected to exceed over $505 million by 2024, driven by the region’s rapidly advancing cement industry, that has been the cause of massive dust and particulate emissions. Indeed, estimates claim that the country’s cement industry records dust emissions to surpass 12Mta – significantly higher than the government’s target of 5.5Mta, signifying growing demand for the product in the forecast timeframe. A major benefit of filter bags is that these devices can be easily installed and cleaned and can efficiently filter particles having diameter ranging from submicron to hundred microns. 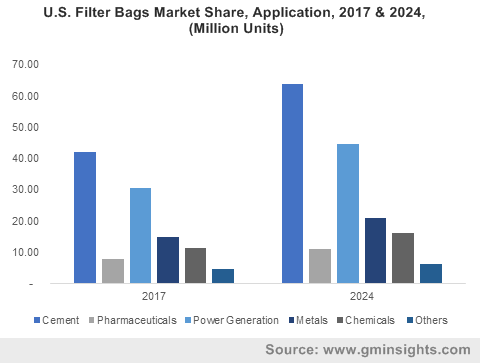 With their substantially increasing demand worldwide and their enhanced application portfolio, it comes as no surprise that filter bags market size is expected to surpass $4 billion by 2024.